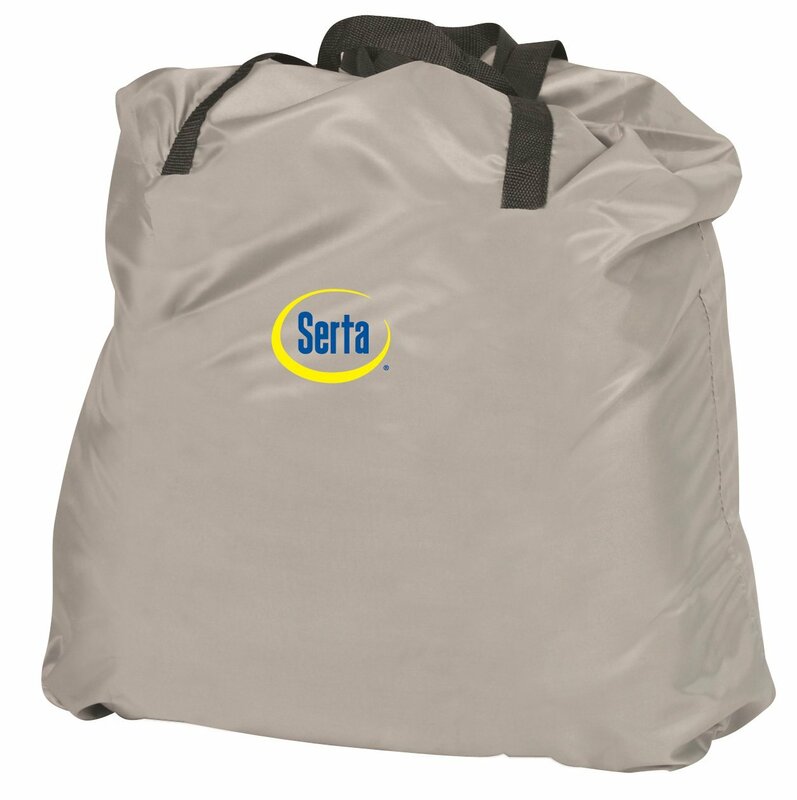 Serta Raised Air Mattress with Never Flat Pump is great for campers who hate waking up with their bottoms touching the ground. This mattress has 2 pumps so it’s guaranteed to never completely deflate. It eliminates sagging and loss of air pressure that is so common in airbeds. Never Flat™ technology is an auto-engaging, whisper quiet pump that maintains constant air pressure throughout the night for an undisturbed, continuous night’s rest that is never flat. Choose your desired comfort level–Plush, Medium, or Firm–and let the powerful Primary Pump inflate the bed. Once inflated, the Secondary Pump continuously monitors and senses when it needs to silently engage in order to maintain the chosen comfort level throughout the night. *The powerful, integrated primary pump enables effortless inflation and deflation of the air bed. 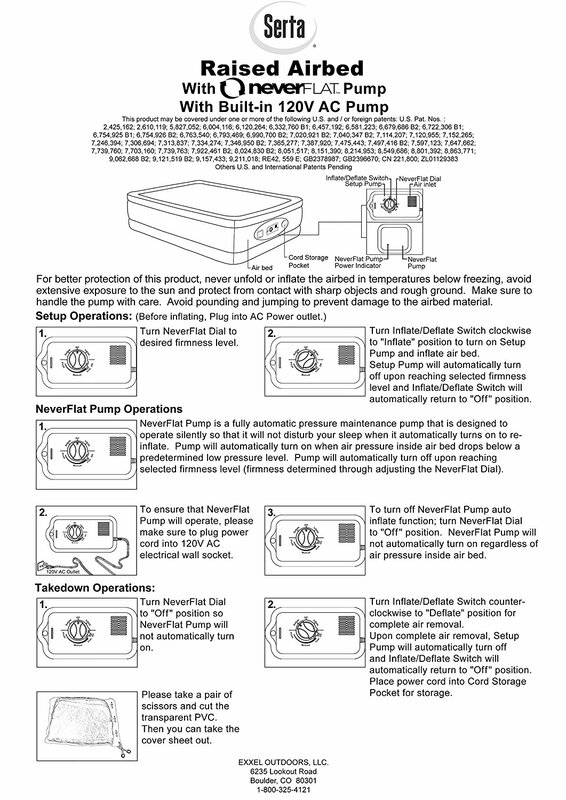 *The automatic shut-off feature turns the Primary Pump once the bed is fully inflated or deflated, allowing you to turn on the pump and walk away without worrying about the pump getting burned out. *Clear dial settings for plush, medium, and firm allow for preferred personal mattress comfort levels. *Pressure sensing technology constantly monitors and adjusts to match the chosen mattress comfort level. *Pump silently, as necessary, engages throughout the night creating a consistently comfortable feel. 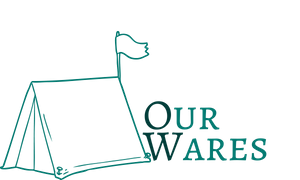 *21 circular coils on the Twin Bed and 35 circular coils on the Queen Bed create a comfortable sleeping surface while vertical and horizontal reinforcements allow bed to maintain shape. *Flocked top keeps bedding in place. *Carry bag included. Guaranteed to stay inflated all night! NOTE: Please ensure that the NeverFlat pump is turned on while in use in order to keep the bed feeling fully inflated. The bed is made from PVC which will stretch as it gets warm with use. As the PVC stretches, the bed will increase in volume and with the NeverFlat pumped turned on, the pump will keep the pressure at a constant level and eliminate the feeling of it deflating. 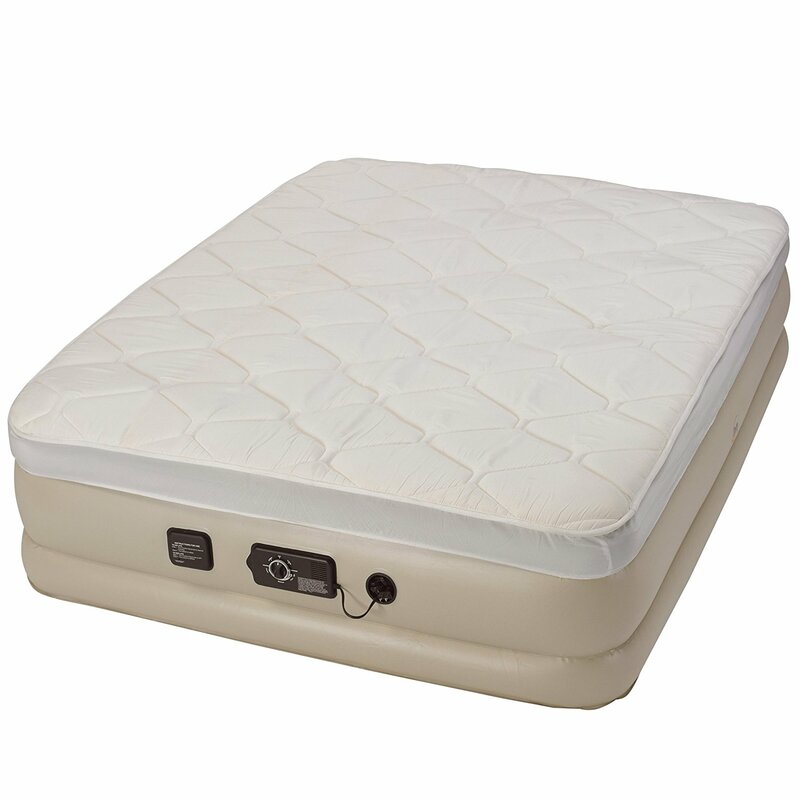 Serta Raised Air Mattress with Never Flat Pump is a popular seller because of it's name. Serta is known for comfort and the air mattress is no different!